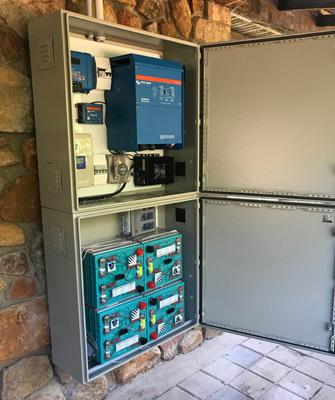 Installing an augmented grid (grid-hybrid) system saves power costs and provides reliable back-up power to increase self-reliance for your home or business. We can add supplementary power from solar and batteries to your existing single phase grid supply. Three synchronised battery inverters can provide industrial quantities of power. The extra power produced can supply all kinds of businesses, from a brewery to the best equipped wood-working facility. We can supply three-phase power to rural locations at lower cost than the grid supply.